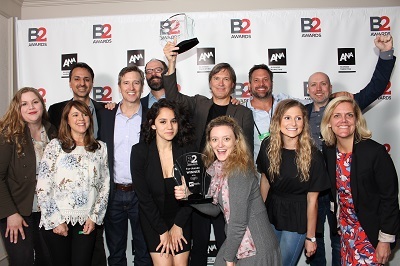 The ANA B2 Awards recognize the top performing business-to-business marketers, large or small, with a unique focus on driving demonstrable business results. This year, there are 32 categories which have evolved to reflect the growing role of B2B marketing and the rapid changes in our industry. Our streamlined list of categories and divisions will allow B2B marketers to focus their entries with greater precision. The B2 Awards will now run its submission and judging processes on a more user-friendly contest platform, OpenWater. With OpenWater's intuitive software, submitting and reviewing entries will be quicker, easier, and faster to manage. A detailed case history will be developed by the ANA's Marketing Knowledge Center for each B2 Award winning entry. These case histories will then be shared with all ANA members. On top of that, the best entries will be later showcased through webinars and presentations. This year, Top Award and Super Category winners will be awarded at the 2019 Masters of B2B Marketing Conference at the Sheraton Grand Chicago on Wednesday evening, May 29, 2019. Be sure to register for the conference and our B2 Awards Gala. B2 Award judges are B2B professionals from all areas of the ANA, including chapter leaders, and committee members, among many others. The candidates are screened by the ANA and are assigned to judge entries from the categories in which they have expertise. What does it take to win a B2 Award? Check out these award winning case histories from past B2 Award winners to find out.